Dealing with dandruff is a pain and when it appears in your facial hair, it can be embarrassingly noticeable. Constantly finding dead skin all over your shirt and the annoying itch is enough to drive any beard lover crazy. Unfortunately, the best way to get rid of dandruff in your beard and mustache is to just shave them off. That is a great solution if you are not particularly attached to your facial hair, but it can be frustrating if you enjoy having a beard. 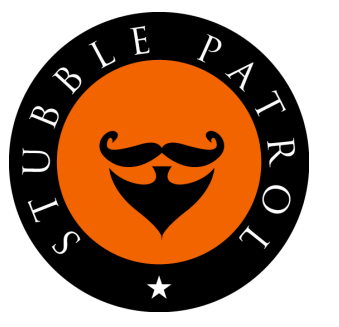 However, there are ways to manage the mustache dandruff, without shaving it off entirely. Whether you have a full on dandruff attack or just some dry skin, here is how to deal with it. Dandruff is an irritating skin condition that results in flaking skin, itching, and redness. It most often affects parts of the body such as the scalp, face, chest, and groin. Dandruff can be caused by malassezia yeasts (a type of fungus), genetics, and lifestyle, among other things. While malassezia yeast is proven to cause dandruff, it is not known how it causes it. 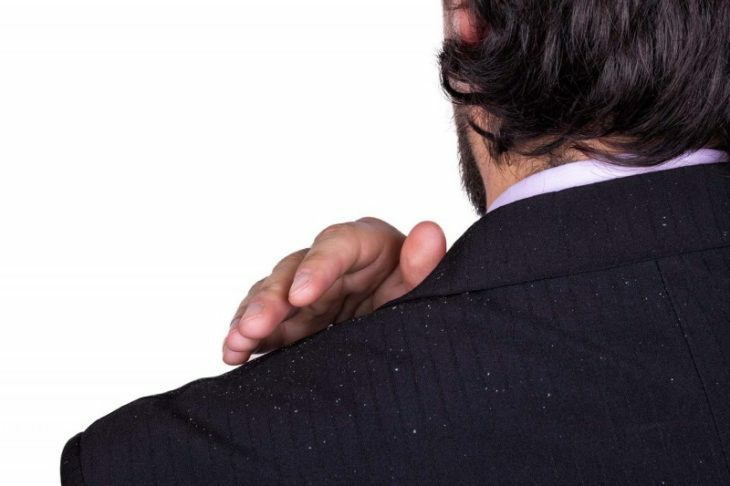 If your family has a history of dry skin, you may be more likely to get dandruff. 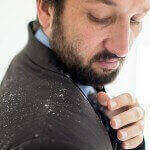 Even your lifestyle choices can cause dandruff. What you eat may play an important part as it affects your skin. A diet that includes a lot of junk food can cause all kinds of problems and the nutrients in our food contribute to the condition of our skin. Dandruff is usually caused by a combination of things, but the right conditions can turn a bit of dry beard skin into a case of dandruff. The perfect conditions for dandruff in the facial hair just so happens to be irritated oily skin (or seborrheic dermatitis), which is quite common. The fact that sunlight cannot reach your skin does not really help either, as that would help kill the fungus. Things like oily skin, stress, fatigue, cold weather, and not washing your face make it worse, so it is easy to see how quickly it can become a problem. Even itching will do nothing except work bad oils and fungus back into your skin, which is not a good thing. Curbing the urge to itch will prevent oil and malassezia yeast from being absorbed into your skin. Itching can also cause breaking in the skin, which will encourage dandruff. As with most things, the causes can also be the cures. This can be very easy, just be reducing stress and getting some sleep, you may be able to eliminate your dandruff. During winter months, keep warm and hydrated by drinking plenty of water. Getting some sun and fresh air might also help with dandruff. If none of the above helps, but you still want to have whiskers, you may still need a little help. While you shave off your facial hair in order to take care of dandruff in your beard and mustache, you may simply not want to lose your facial hair. Effective products for helping with dandruff are available, and while there is not technically a cure for it, these products should help lessen the effects. The biggest thing is just plain washing your face, it may seem obvious, but keeping your facial hair clean can go a long way towards healthy skin. It is best to avoid using harsh soaps that dry out your skin. To see the shampoo that I recommend that is designed to help with beard dandruff, click here (available on Amazon). Using shampoos and soaps specifically for dandruff are the best options. Anti-fungal cream may help as well, since malassezia yeast is a fungus. Be careful when choosing products, because being sensitive to some hair care products, also known as contact dermatitis can cause dandruff. It may seem counter-productive, but using beard oil can also help with dandruff. It can help hydrate follicles after using dandruff shampoo. You do not want to make your dandruff worse by drying out your skin even more than it already is. A good method is to first gently cleanse your face, then shampoo (rinse well), and lastly, apply beard oil. You may even want to consider adding a facial scrub to your routine twice a week. It is important to remember that what might work for someone else, may not work for you. Experiment with different products and routines to see what works best for you. Most cases of dandruff do not need professional care, but if needed, visit a dermatologist for information and prescription dandruff products.